Josephine Mandamin: The water flows from the five Great Lakes to the St. Lawrence River and out to the ocean. Consequently, the carrying of the water will complete its journey once it stops at the mouth of the ocean. All Water walkers have begun to understand that once the pail of water is picked up at the beginning of the day, it keeps moving until it rests at the end of the day. Similarly, the Eagle Staff has to rest before it gets dark. 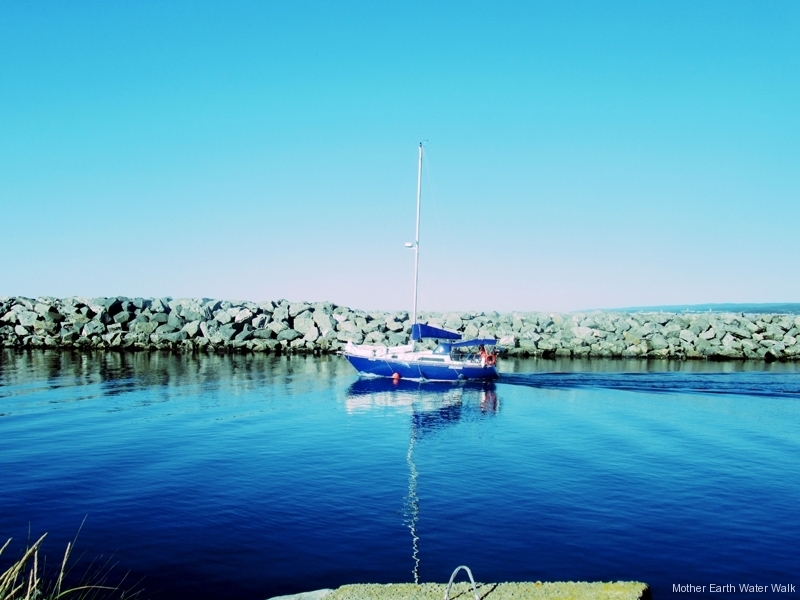 We must keep it moving until we have reached our final destination at the Gaspe Penninsula. April 10, 2009: “Never fear the unknown” words keep popping in my head today as I am packing and hoping not to forget anything. Apprehension and wonderment creeps in from time to time because the journey is so great and monumental to me because I have never seen the St. Lawrence River other than in pictures. I do know that it has Great Meaning to the ancestors and the people who now live by the river. It is with such respect that I look to them for prayers and support. My father always said that “one who is always fearful of going somewhere, never gets anywhere” such is my life as I journey, always remembering my father’s words. 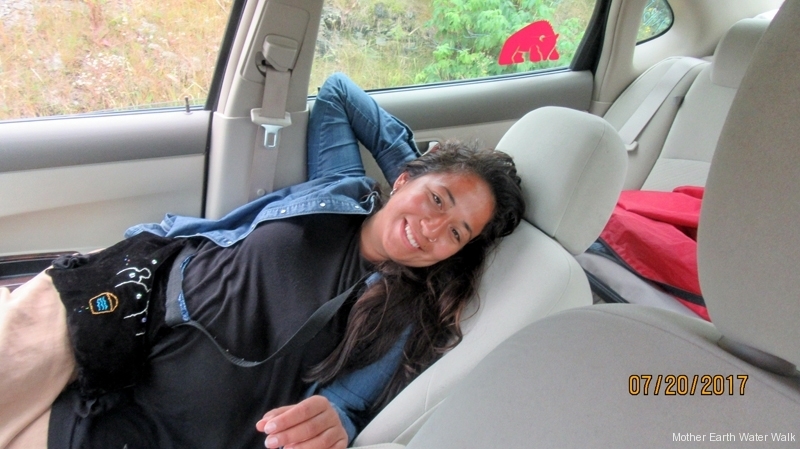 April 11, 2009: We are caravanning the van and truck to Kingston. We leave at 4:00 am. My sister Melvina, Lee Hardy, faithful friend, Josh Metansinine, my grandson and his friend, Chris. We will pick up Gabe Peltier in Espanola and then we hope to stay overnight in either Parry Sound or Bracebridge, Ontario. April 12, 2009: We arrived in Kingston. We have been promised Footcare by SOADIE on Sunday. We know that we will meet up with Debbie Danard, Jay and baby: Tuh Tog Once. Tara said she will be travelling also at the same time we are. Sue Chiblow and her group with the Union of Ontario Indians will be there on Sunday. We are so grateful for the encouraging words from our Grand Chief Bawdwaywidunn and of course our Mide Family. The Ontario Native Women’s Association has come through with approving the rental of a van for us and the Union of Ontario Indians has sponsored the cost of the Waterwalk Buttons. We will print Brochures as we go along, at Printers here and there. We say Migwech to all who have supported us in more ways than we can say. We are taking Moose meat, fish and wild rice for the Feast on Monday. So we have much preparing to do. We also will welcome each day with Sunrise Water Petition as always. We are not sure if there will be a drum at the Send-Off Gathering, but Faith in Spirits always carries us through. So, we shall keep in touch this way as we journey the next few days. Obama minwa. Nin Beedawsige aka Josephine, your friend and humble servant. April 13, 2009: The Send-Off today brought us many good feelings and messages from the people. The Kingston Friendship Centre was very accommodating and as well the SOADI Group who gave us foot care on Sunday when we arrived. They also put us up at the Holiday Inn for a good rest. Tonight accommodations were provided by Peter Dundas and Pam Cross in their cabins and home. A home cooked meal was provided by Pam and the cake was phenomenal. Their home is beautiful and warm, very homelike and inviting. Debbie is driving us crazy with her camera but we love her. Send us some chapstick, Our lips are wind burned. We will get 3 – 4 hours of sleep now. Good night. April 14, 2009: We almost reached Prescott today, shy by 5 KM. We started at 4:10 this morning after a quality rest at Peter and Pam’s. Sue Chiblow and Jayce, Debbie and Jay and baby and the 6 of us from TBay. Peter and Emily walked for a while, and Sue had to leave about 4 PM. The St. Lawrence River is beautiful. We fell in love with the majestic beauty as we walked beside it today. We sang our songs, offered tobacco and petitioned to the Powers of the Water. We managed to find a motel to sleep for tonight. We will rest and wake at 3:00 am. Good night to all as we have been getting encouraging words from all over Indian country. Thank you all for your powerful prayers and such encouraging words. Gichi Megwech, Nin Beedawsige aka Josephine, your friend and humble servant. April 16, 2009: Today was Pipe day with two in attendance. We also had a hand drum sounded for the first time by Jay Bell’s beautiful singing and awakening of the new hand drum given to us by the people of Akwesasne. Jay, Debbie and Tuh Tog Ense left us shortly after. They were so missed after they left, our little Waterwalker especially because the boys got to enjoy her laughter. We made it as far as Dundas, New York as we crossed into the Quebec side. We put in 87 KM today with the help of Iroquois community as they guided us in the right direction. We will study the map again to estimate our distance to the next town. We crossed two bridges today from Cornwall to the other side. Tonight we rest easy knowing there are petitions and prayers for the water. We have been hearing from people all over the world. The message is growing, people are awakening their lakes and singing, praying and loving their lakes and rivers. If only the bureaucrats and money changers would understand that the unborn have yet to live. We all must work together, big and small. It is getting late, we will be up at 3 am, and finish tomorrow before dark. the Eagle and water is now resting, as we are. Take care and love the water. Nin Beedawsige aka Josephine, friend and humble servant to you all. Yesterday we got close to Cornwall. We got invited by Henry Lickers to his community for Feast and Social and what a marvellous evening of fine Native dancing and food. We went to bed late and up on the road by 4 am this morning. We have Jack St Thomas, Elaine McDonald, David Denneny walking with us until 7 am. It is now 11 am, we have crossed the border at Cornwall. Right now we have the Mohawks out in full force with us. We are nearing the Casino. Today is Pipe Day. We will stop at high noon to fill the Pipes. We have mine and Gabriel’s to lift with our supporters. Take care. Nin Bedawsige, friend and huumble servant to all. April 18, 2009: The Water Walkers were met somewhere around Chateaugay, they are in the good care of Mohawks for this evening, and they have a place to stay at tomorrow. CBC french has information on their whereabouts and are supposed to braodcast about it. The Mohawks radio doing the same. The Water Walkers should be met by different people supporting them tomorrow, and they have a place to stay at tomorrow night in Longueuil. I am trying to reach as many people as i can and organizing their stay in each community. Once this is accomplish i plan on joining them. They are tired, but their spirits are really helped by everyones’ support and prayers. Josephine said she really feels the asehma that is put out there for them. 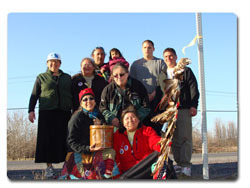 April 19, 2009: Today we walked from Kahnawake to Longueuil after being received at the Riverside Inn where we were treated with great care by Lynn Beavais and Brooklynn Leblanc. The rooms were the gift of Glenda and Keneth Deer what hospitality and comfort, a must see place indeed right along the St Lawrence Seaway. 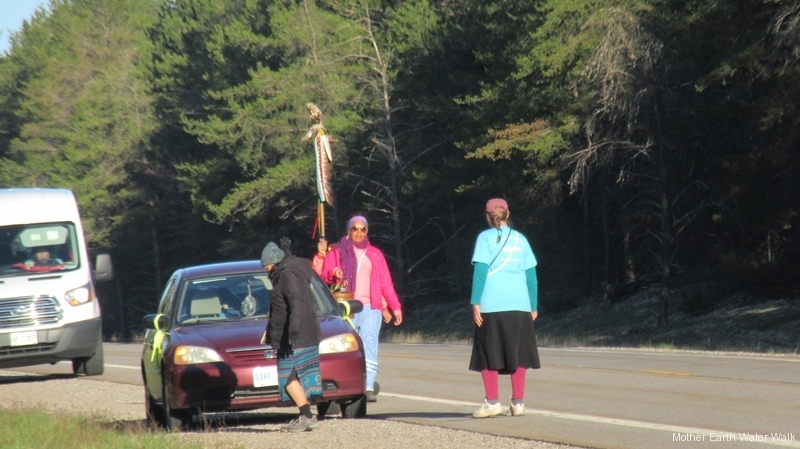 The walk into Kahnawake was a guided effort by Barbara little bear and daughter Towana Miller, the generosity of the people was most generous including the fuel from Merricks gas station even treats were on the house. Todays walk had several visitors including our chilean guest thanx for the copal. We have been received this evening by the mothers of Maison De Priere a fine home cooked meal was enjoyed not withholding delicous chocolates. One last thank you to Barbara and her crew for the meal at The Riverside Inn it was a treat complete with Lemon pie. April 21, 2009: Today we almost reached Nicolet. We toured the town of Odenak and felt the Spirits of our ancestors still there. Last night we stayed at this house which so reminded us of home when we were kids. We all slept in one big room upstairs on air mattresses and cushions. We slept well. We were up at 2:30 am because Melvina kept having laughing dreams. We were on the road at 3:45 am. Melvina and I almost fell on each other and in her attempt to catch me she herself went tumbling on the sidewalk. Gabe didn’t know which woman he was to catch. Melvina was okay and later, much later we had a good laugh about it. We walked through rain all day. The freshness of the water felt so heavenly and kind compared to the waters we saw in ditches. One area had rust colored, brown water and Mother Earth was trying to look alive despite the poison in her veins. I stood looking at her stillness and talked to her: Mama, bis egween, anish kawn. apitchi gisaw een, Ween Dah Mawshin Gay shey Nawd Mawuk N’wiji anishnabe, Guy ay osh meh gay zhi weenduhmahgayyawn Nibinji. With tears rolling down my cheeks I offered my Asema to her. Migwech Mama. It was a challenging day with wet feet, shoes and clothes. Our friend Benjamin had to leave due to car problems. We have seen much obstacles. I had to drive back to Sault Ste Marie on Saturday to take back our young walker. We are gifted with a balance of laughter and we are so like a unit. We cry together, laugh together and work together for the water. It’s all about the water. Goodnight. Sleep tight you all. Nin Beedawsige aka Josephine, your friend and humble servant. April 23, 2009: We were warmly welcomed by Chief Jean Philippe Sioui and his wife Michele and their beautiful children ( twins & baby)and her son at Wendake. We were treated to an honest to goodness home cooked meal prepared by Michelle. Such beautiful traditional people. They really made us feel like family. We are Family. We then went to the Longhouse where we were again treated like we had known them forever. We danced to the water drum with the women in the community. We then went to sleep in the beautiful home of the Chief and his wife, Michele. The following morning the Chief showed us the way out of Quebec City. This was again very special for us to have the Chief get up at 3:30 am to show us how to get out of the freeways. April 24, 2009: We were joined by Debbie, Jay, Zenia, and Talyn. … two Huron women from Wendake, Lynn and Nathalie, and then Madeleine. We walked in good spirit, strong walkers, Today was Pipe Day and completed with the music of the flute from Natalie. The day ended with a beautiful spectacle of honking snow geese, thousands of them on the shore. April 25, 2009: We started the day @ 3:45 am, we walked from Saint Antoine de Tilly to Beaumont. Walked through Quebec and Levis, and it was fast paced, really hot. All the walkers are in good spirits, and Josh really enjoys Tony and Madeleine’s Toy(the VW). It was really good to feel the fresh breeze as we approached Beaumont, with still some refreshing snow on the ground in some spots. There is a lot of traffic on the river, and on the road too! We met a few people who were really interested in the Mother Earth Water Walk. I have rarely seen so much love and dedication for the children of the future. The focus is on the Water and the future generations. This walk is helping us understand what doing the work is all about. Chi Megwetch to the Water and to all who support the Mother Earth Water Walk. Tomorrow we are supposed to be joined by Maryellen Bake but we have not heard from her yet. It is now 8:00 pm. We are going to sleep now, good night. April 30, 2009: After a beautiful long day of great joy, even if all are tired, we are resting in Sainte Flavie. We did not have access to internet and even the cell phones communications are challenged. We are in the beautiful appalachian montains, and the Chic Chocs. The water view is spectacular. It is so good to be here and walk for the Mother Earth Water. On Monday we were in Riviere du Loup, we spent great time with Ann (Annie), a Maliseet 93 yrs old Grand Mother, and mother to the Maliseet Nation Grand Chief of the Viger Community. We were so warmly welcomed By Grand Chief Ann Archambault, and her assistant Marie-Christine. Today we were greeted by a beautiful shooting star as the walkers were starting their first steps of the Water Walk! Then a lunch time, The Walkers were greeted in Rimouski by six Migmaq community members, many eagles visited today, and a women from Rimouski, Gabrielle walked with us. They brough food, gifts to help with the journey, a Migmaq flag, and a beautiful fancy basket with sweetgrass. They walked with us for a while and it was really good to be able to spend time them. Josephine spoke to them about the Great Migration, and about how History-making this event is.They were very happy to be there with the Water Walkers. The words to descibe the emotions felt by all over the last few days would be limiting to what we want to express. Josephine is so strong and inspiring. We are happy to be here. 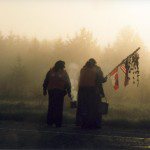 May 01, 2009: The grand finale of the Mother Earth Water Walk. The celebration will be held at the community hall of the municipality of Riviere de la Madeleine in Gaspesie, Quebec at 6 pm, with the community, the presence of the Migmaq from Gaspe, and news people. Please contact the municipality for more information. We may arrive a little late, but we will be there! May 17, 2009: Time is not ours and time has kept me busy tending to other matters. On May 1, 2009, we finished our St. Lawrence River Waterwalk 2009 with humbleness and gratitude to the wonderful group in Riviere de La Madeleine who welcomed us with a Feast and a place to sleep for the night. We slept in for once. After our Finale of Tobacco and Pipe filling and lifting the Water, we took a ride to the ocean; officially and truly celebrated our journey’s end. It was a moving experience to stand by the ocean in the darkness of the night light and sing our songs and offered tobacco to the Water. She accepted with great gushing of her flow as she took our tobacco. We stood in respectful silence. We knew she was listening. We knew she was accepting. We knew, she knew that we loved her above all else. She is in our blood, uniting us all to peace and harmony. She knows we mean no harm to her. She knows we will protect her in all that we can. This is what we have been governed to do. We turned and walked away and did not look back. We knew we would return again someday. It is understood that the journey to the West had turned around. We carried the Water to the East, from whence we came. The Littles Turtles have left the eastern shores to travel to the Great Lakes. We may have met them somewhere. Time is fast approaching, we do not own time. We must keep a watch over the waters and the sky. We must begin to love one another. We must begin to help others understand the water. It is in our Lodge teachings that water is above all else, the uniter, the healer, the caretaker and all else we can never imagine. We are ever so grateful for the people who have made the journey lighter for us. The support of encouragement was felt from all over the world. Our Lodge family’s prayers were heard and seen as the eagles flew above us. The distance our supporters came to walk with us is admirable; our famous Maryellen Baker from LCO(Hayward, Wisconsin) and Ramona Bronson, from Chicago travelled all the way to come walk with us. The Clilean brother who came when we needed help; thank you Benjamin. Madeleine, who came when we were so lost in the language; – she came as an angel to ease the barriers we were facing; thank you. For the people who put us up to rest our weary bones; thank you. You know and the Spirits know who you are. Chiefs and Leaders in their communities who came to offer encouragement and financial support; we thank you. From the moment that I touched the St. Lawrence River on the second day, the feeling was akin to falling in love; – and breathtaking to touch the sacred element of her being. Words cannot match the feeling of love, tenderness, gratitude; – I could only utter a thank you and gulped at the feeling of love in return. My love for the Water is eternally sacred. I will go to any length to protect her and carry her message. “I love you, Mama”. Tender moments are shared with and by the walkers who sacrificed their time, fully committed to the message in the water and songs. They became Family after sharing hardships, tears and laughter. This is what family is all about. We were brought together for a cause. Melvina, sis; thank you for your ever protection and care; Lee, our friend; thank you for your persistence and the pain you have endured in following your teachings of the Water; Joshua, grandson; you have been the light of our journey and kept us young at heart; forever faithful and nurturing to your grandmother; thank you; Gabriel, my friend, who walked with us in Wisconsin last year and felt the 2009 Waterwalk urging; you have been the physical strength we needed; your quiet patience is admirable but you can also give and take. That is so admirable and appreciated. You came when we needed you. You were sent by the Spirits, even though you didn’t know it. Or did you? The end is never the end. It is only the beginning. The beginning of something that is not within our knowing. I rest in that thought because I am always asked; – now that the Great Lakes Basin Walk is ended, what is your next walk. It’s all about the Water, not the Walk. Who knows where the Spirits will guide us? Migwech to you all. Nin Beedawsige aka Josephine; your friend and humble servant. 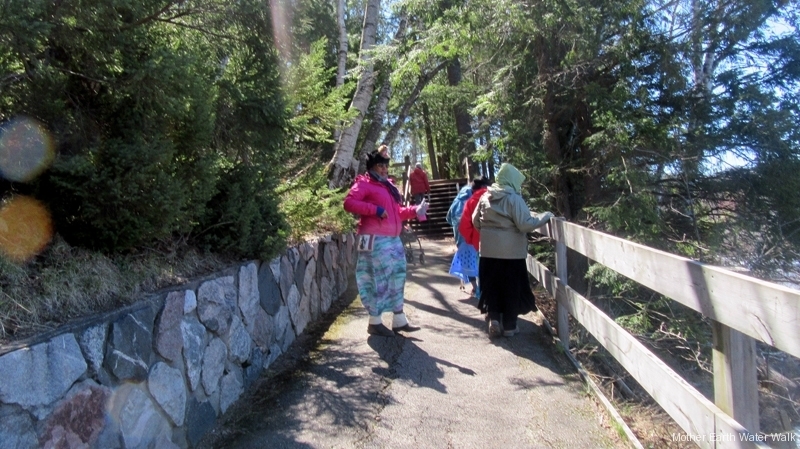 Thanks to all who supported the Mother Earth Water Walk St Lawrence River 2009.